In the most recent version of Opera Mini for iOS, we introduced night mode to dim your screen and help you get a better night’s sleep after late-night browsing in bed. If your spouse can’t sleep because of your screen’s bright light, Opera Mini can help. The bright light emitted from the screen can disturb other people around you at night. Reading a bright screen in a dark environment hurts your eyes and keeps you awake. By contrast, red color tones are associated with sunset. Your brain interprets them and thinks it is evening and time to go to sleep. From a biochemical point of view, these tones protect melatonin, the sleeping hormone. Enough of the advanced biology. Simply put, night mode dims your screen even more than iOS does by itself. 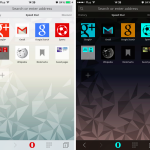 And, Opera Mini offers a bedtime option that adds a subtle orange overlay on top of the browser. This overlay filters out blue tones and enables you to sleep more soundly. Go to Settings and tap Night mode, then toggle the Enable switch. 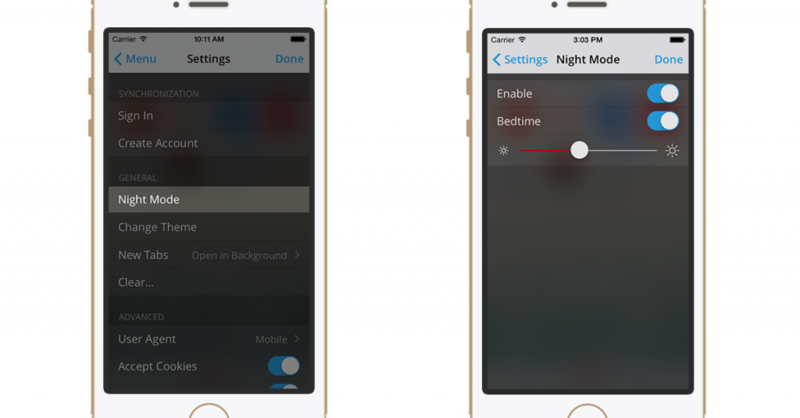 You can choose the bedtime option to reduce eye strain and adjust the brightness level. If you have questions, join the discussion on the blog, comment below or come say “Hi!” on Twitter and Facebook. 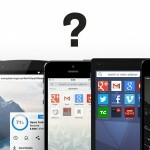 Download Opera Mini from the App Store.